In January of 1996, during a visit to the UK, friends and I patronized a posh Chinese restaurant on the outskirts of the Knightsbridge neighborhood where we were staying. Just hours before our arrival, Mel Gibson had exited with his companions after enjoying a meal he deemed "superb." The waitstaff stood proudly over our menu-holding posse while brandishing a large scratch pad and spinning the now famous story of Mad Max And The Glorious Bang Bang Chicken. It would become legend because Mel and his mates apparently were in stitches, repeating the words "bang bang chicken" in a bizarre and animated manner until the dish actually arrived. Then everyone ate and went home. Faced with the idea that we might be bold enough to reject the entree that had actually pushed its way down the gullet of an Aussie superstar mere hours before our arrival, the head waiter leveled a stern look at our table and told us without words exactly what we should be ordering. Cut to 2012 and a devastating downward spiral has befallen the juggernaut of yesteryear. His career is all but extinguished due to a series of bad choices, off-color rants, drunken escapades, and all-around jackassery. Nowadays it would be fair to say that getting the stamp of approval from Gibson would be considered faint praise indeed. As a matter of fact, some might consider it more toxic than the kiss of death, with one exception. Mad Max. It has been said that this film franchise should be left alone and not picked over like the bones of so many once classic movies. You could not replace Mel as Max. Until now. It seems that thespian freight train Tom Hardy has been hard at work in the Namibian desert putting his particular brand of magic into this role and guess what? Mel approves. 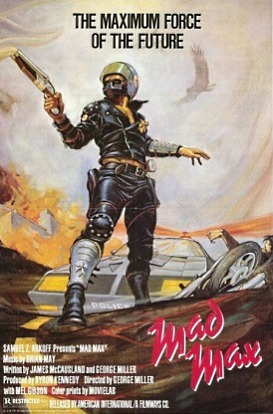 When asked how he felt about someone else stepping into the iconic shoes of the Road Warrior, he came back with a stamp of approval, calling him "a good choice." In light of Gibson's very public lack of generous spirit on many fronts, it's telling and not a little startling that he would so publicly pass the torch concerning the character that put him on the map to another actor. But Hardy is no ordinary thespian. His performances come storming out, one after another, and everything they throw at him he devours like a feral child eating its first roasted chicken. When I first saw him act, it was like coming across an exciting new scientific find, so I was pleased to hear he'd been cast but hesitant to get behind a remake that I was less than thrilled about. There's been no shortage of Hardy on the big screen lately (The Dark Knight Rises, Lawless, Inception, Warrior, This Means War), and he chances flooding the market if he doesn't spread himself out a bit. However, his ability to change his physicality and accent with such ease might allow him to dodge the bullet of being forever typecast (for proof, watch Bronson, Wuthering Heights and Guy Ritchie's woefully underappreciated RockNRolla). Only time will tell if resurrecting Max was a good idea, but my money (and Mel's ) is on Tom.